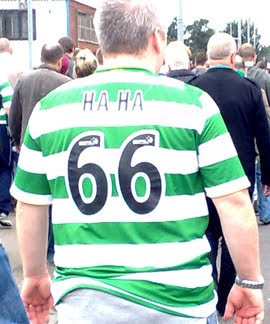 Hot on the heels of the story below breaking this image of a sick Celtic supporter mocking the disaster at Ibrox stadium where 66 people died appeared on one of their fansites. With a quick google search It appears this Celtic supporters view is held by many of his fellow fans. Sports Direct also immediately changed its printing policy after a Red Devils fan posted images of the shirt on the social networking website Facebook. The fan paid £55 for the shirt and the slur to be printed about the 1989 disaster which killed 96 Liverpool FC fans. On it, he chose the number 96 and under it the words "Not Enough". Above the number were the letters YSB - which stands for You Scouse B*****ds. The man's Facebook page was shut down. Sports Direct said the employee who marked up the shirt did not know what the message meant. But Margaret Aspinall, whose son James, 18, was killed at Hillsborough, said she did not believe that. Mrs Aspinall, chairman of the Hillsborough Family Support Group, said: "I think Sports Direct are worse than the guy who wanted it put on the back of his shirt. Printing that message is like inciting trouble, it is an absolute disgrace and Sports Direct should be ashamed. "It is terrible for people who lost someone at Hillsborough to think their loved ones died so this guy can go to watch football in safety." Sports Direct has 470 stores nationwide and is owned by Mike Ashley, owner of Newcastle Utd FC. A company spokesman said: "Sports Direct has been notified that an extremely offensive and wholly inappropriate football shirt was printed at one of its stores. The store assistant printed this unknowingly and has been deeply shocked upon being notified of the significance of this and the upset caused. "As a result, Sports Direct has taken immediate action and changed the administration policy for printing football shirts across its store network. With immediate effect, it will only allow printing of current football players names and numbers on football shirts."